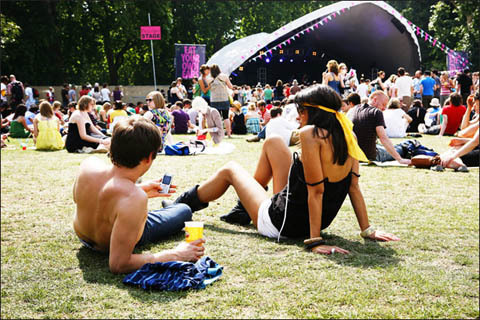 For any Londoner who is already showing signs of festival fatigue, you can get your music fix in Victoria Park on July 31st, and then go home and sleep in your own bed. Result! There’s a real charm to one day festivals: your money doesn’t run out, treatment you don’t have someone peeing on your hammock (thanks Benicassim) or shouting at all the non-Welsh people to go home (thanks Beach Break) whilst you try to sleep. You don’t even have to worry about how to wash your hair, price whether you’ve drunk more than today’s ration of alcohol or if your mum’s trying to ring you on your dead mobile. Whilst you’re not going to be able to catch as many bands at a one day fest as you would a marathon event like Glastonbury, when they’re organised well, one day festivals still offer fantastic value for money. Imagine that, for under £35, you can watch Phoenix, The Fall, Caribou, Lightspeed Champion and These New Puritans play at the same festival and on the same day, and you’ve got some idea of how good this year’s Field Day festival will be. Located in Victoria Park, it’s the fourth year that London’s promoters have joined forces to put on one of the capital’s most unmissable events. I haven’t had the chance to go to Field Day before (thank you recession), but this year I’m rallying the troops and planning to take Victoria Park by storm. The fact that Anna Calvi, Egyptian Hip Hop, Memory Tapes, Chilly Gonzales, Hudson Mohawke, Gold Panda, Mount Kimbie and Toro Y Moi are all playing means that, for me, this is one of the most exciting festivals of the summer. Even my discovery that it rained last year hasn’t dampened my excitement. Field Day combines great bands with fantastic dance music, which is always guaranteed to be fun. The Simian Mobile Disco DJ set should be good, even if it is just a DJ set, as will the Blogger’s Delight guys and the very talented Stopmakingme. I expect sunshine, yummy festival food, drunk dancing and an army of cool kids. With the knowledge that it all ends in time for the last train home, the thought of dragging myself to work with a hangover doesn’t seem like a bad trade-off for a day well spent at one of the best British festivals – even if it does last just one day. At £33.33 it’s almost too cheap to miss. 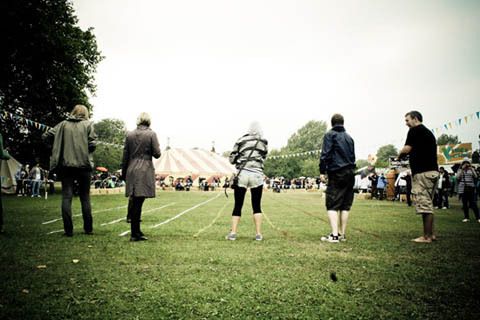 Field Day takes place on July 31st in Victoria Park, London E3. Tickets can be found here. Field Day is excellent fun! We went last year and had a great time at the Village Mentality area having a hay bail fight and swapping clothes at Mrs Bear’s swap shop. Can’t wait for more of the same this year. Can’t believe Pheonix are headlining – should be good. See you there. Hey girlies – get yourself over to the DIY Fashion ‘n Swap tent for some clothes swapping action. For the bargain sum of only £3.50 you get to swap up to 5 items. So bring them along and join in the fun. More info on the website: http://www.mrsbears.co.uk.